Prime among these confusing minor-but-actually-major mechanics is Artifact Pathing, which is the game’s term for what a unit targets each turn. As it turns out, a full understanding of this deceptively simple set of rules can contribute enormously to your ability to avoid those unfortunate oh-I-didn’t-realise-that-would-happen occurrences. Below you’ll find just about everything you need to know about Artifact’s Pathing rules, including what determines unit Pathing, how to reset Pathing, and how certain abilities such as Swap affect Pathing in interesting and possibly unexpected ways. Ready? Nor am I. Apply some downward momentum to your mousewheel and let’s puzzle this out together. You may have noticed during your games that units will not always attack what is directly in front of them, even if it seems like they should. 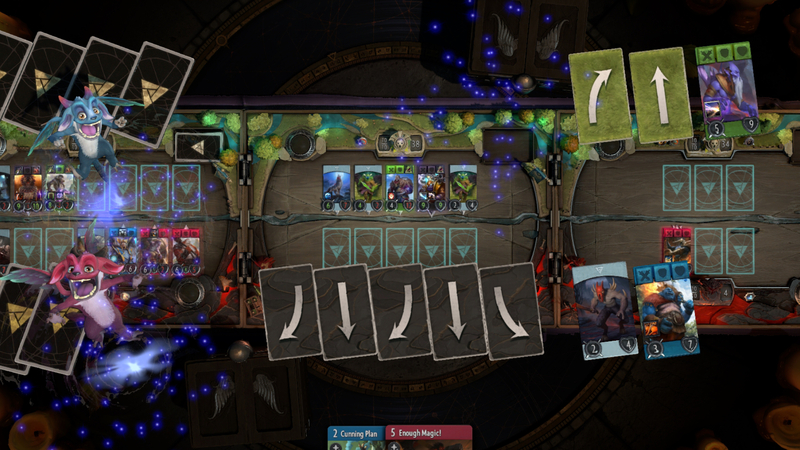 The answer lies with a secret set of cards known as Pathing Cards – and in fact, you’ve likely seen these cards being played many times before. 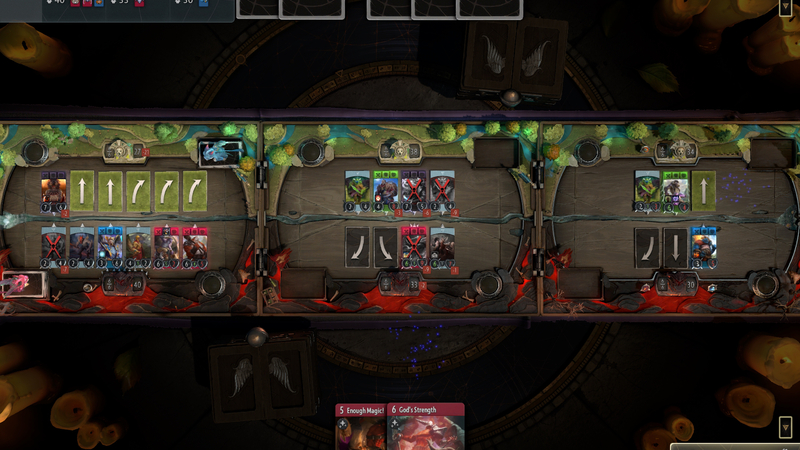 They’re the arrow cards which appear briefly at the end of the Deployment Phase, just after you’ve bought your items and designated lanes for your heroes (if you’d like a better grasp of the various phases of a game of Artifact, head on over to the Turn Structure section of our Artifact guide). On round one, units will always path straight forward, which makes each of the lanes at first nice and easy to understand. However, on subsequent rounds, each unblocked unit (units which are not immediately opposite an enemy unit) at the end of the Deployment Phase will be randomly assigned one of three Pathing cards: Forward, Left, or Right. If a unit paths forward, then they will attack what is directly in front of them – i.e. the opponent’s tower. If a unit paths left or right, they will attack the left or right enemy neighbour, respectively. Now that we’ve peeled back this precursory layer of the Pathing Onion, the important thing to bear in mind is that the game is biased towards direct attacks. Forward Pathing has a 50% chance of occurring, while Left and Right Pathing each have a 25% chance. If you like you can think of it as a deck of four cards containing two Forwards, one Left, and one Right. What’s more, if a unit draws a Left or Right Pathing card and there is no corresponding enemy neighbour to target, then that unit will default back to a direct head-on attack. Which makes sense, really, because if not then that unit’s attack would be wasted hitting thin air. So if two out of the three of a unit’s possible targets are empty, then there is actually a 75% chance that the unit will path straight forwards. The above screenshot has been annotated to show the overall probabilities of the Pathing Cards that have been assigned. Note that the top-left card is treated as a forward arrow, because there is nothing to target to the left. Ways to reset Pathing – If a unit is pathing left or right and something happens which removes its target from play, then that unit’s Pathing will reset to straight forward. Similarly, if you block a unit, then that unit will reset its Pathing to a direct attack on the new threat. These are very useful tools for manipulating the genetic makeup of a lane to your advantage before the Combat Phase. Abilities which override Pathing – There are certain cards which override a unit’s current pathing direction and lets you choose the direction it attacks. You’ll want to look for units with the key phrase: “Choose a combat target for X”. These cards, while situational, can provide your deck with some much needed utility during times when the randomness of the Pathing system does not favour you. Unblocked spaces – At any time during a game (not just during the Deployment Phase), if a unit is deployed or moved to an unblocked space, a new Pathing Card will be drawn to determine which direction the unit will now attack. Blocked spaces – If you deploy a unit into a blocked space opposite an enemy unit, then it will not draw a Pathing Card; instead it will path straight forward automatically. If you’re having trouble conceptualising all this, think about it this way: if there’s a space on the board for a Pathing Card to be flipped over opposite your unit, then there will be a Pathing Card. If not, then there will be no Pathing Card, and the unit will default to attacking straight forward. As you’ll know if you’ve cast your eye over our handy guide on Artifact keywords, Swap is an ability which, predictably, swaps the positions of two units. Sometimes Swap is limited to neighbouring cards; sometimes it bestows the freedom to swap with any other allied unit. However, the crucial point is this: you can swap the units around, but the pathing directions will stay fixed in place. It’s rather confusing to explain in text, so I’ve prepared a little gif below to illustrate this point. Here, I play Cunning Plan, which swaps the two units in the lower-right corner of the lane. Keep an eye on their arrows, and you’ll see that while at first the arrows seem to swap over along with the cards, they then rotate back to their original positions. Confused? So was I at first. Don’t worry. It takes some time to wrap your head around the intricacies of the Pathing system as a whole, but once you take all of these tidbits of information into account, you’ll find that you are able to influence the game on a greater number of levels than before, and possibly than your opponent. A great way to get used to the Pathing system and to see all these rules in action is to slap together a test deck (I’d recommend Green/Blue for the purposes of this), and fill the deck with nothing but creeps and abilities which move around or swap units. Then play against a bot, and just try out different things. You’ll soon get the hang of it, and the rules will become second nature. Hopefully that clarifies a few things, and answers some of the pained “but why…?” questions you had after that last game. While we’re talking about decks, why don’t you head on over to Dave’s Artifact best decks guide? Or alternatively, you could have a gander at crafting your own using this handy walkthrough of Artifact deck construction principles and guidelines.